Having recently purchased a camera from TradeMe (New Zealand equivalent of ebay), I now realise that I made several mistakes. The camera was a Canon 5D with a 24-105 F4L lens and was physically flawless. It appeared to have been very well looked after, and the test shots looked fine, so I have to admit I wasn’t as cautious as I should have been. But the day afterwards I noticed what looked like very fine cracks in all my photos.  Some quick internet research revealed that what I was seeing was fungal growth on the CMOS sensor! How did I not notice this? The problem was that I went to have a look at the camera after the sun had gone down, thus all the photos were taken in dim indoor lighting which needs wide a aperture for proper exposure. At wider apertures much of the light hitting the sensor comes in at a wider angle, and as the sensor has a filter in front of it some light can get behind foreign matter on the surface of the filter before hitting the sensor. Narrow apertures show up dirt far more readily as the light is coming in from a narrower range of angles. Needless to say, these marks have a very visible impact on any pictures with an aperture narrower than about f/7, and looking back I can even make out the fungus in the original test shots I took at f/4. Fungal growth on the sensor could potentially be expensive, as a by-product of fungus is an acidic compound which could eat away at the coating on the filter. Worst case is that it needs a new filter, which should not be expensive in itself but would expensive in terms of labour as it requires dismantling the camera. So I’m hoping a simple clean will put it right! So, the lesson I learned is to take some test shots in BRIGHT LIGHT, at both narrow and wide apertures. Narrow apertures reveal dirt on the sensor, and wider ones are more likely to show up any lens issues such as fringing or bad focus. Go to view the camera during the day, not at night. Take your own memory card along so you can examine the shots in more detail when you get home. I did this, but the wide apertures meant that the fungus was barely discernible, and it was on the edge of the image where the picture was out of focus anyway, so I wasn’t looking in the right places. Take test shots of the sky or another brightly lit background at the narrowest aperture possible (normally f/22) and +1EV (exposure value). If you simply can’t arrange a time during the day, flash shots of a clean white or lightly coloured wall should suffice. Or you could use a long shutter speed, since dirt on the sensor isn’t going to move you don’t have to worry about camera shake or motion blur… just make sure you get the right exposure. If purchasing a lens with the body, take some shots at the widest aperture possible, as these are far more likely to show up lens flaws such as fringing or bad focus. Examine the sensor by putting the camera into “sensor cleaning” mode. This flips up the mirror so you can see the sensor. To do this on a 40D you would go to setup menu 2 (yellow icon with two dots) > Sensor Cleaning > Clean Manually. On the 5D just scroll down to it, it’s in the orange setup section close to the bottom. There are no doubt many other flaws to look out for in cameras which I haven’t touched on here. So be sure to look at other sites with more complete information, but nonetheless I hope this has been useful for someone! Probably what most people reading this are going to want to know is; did the sensor clean fix the problem? Unfortunately it didn’t, and Canon quoted me $2500+gst in parts alone for repairs (which is a new sensor assembly). Since this is considerably higher than the value of the camera, it’s basically not economic to repair unless you know someone capable of replacing the filter or dismantling the camera and cleaning it properly. This entry was posted in Photography and tagged camera, opinion on May 17, 2009 by Alex.